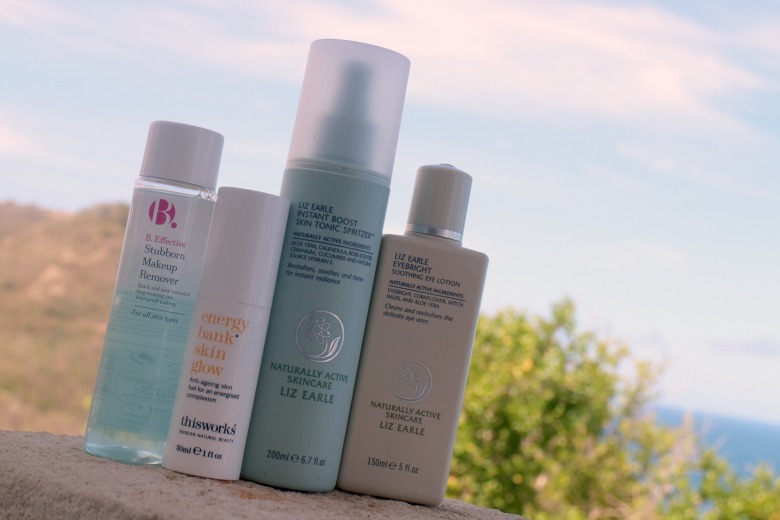 Following on from my post on DHC Cleansers today I'm sharing some more products in my skincare line up from my trip to St Lucia last month. First up is an impressive high street favourite, B Stubborn Make Up Remover* which is a dual action formula and certainly reminds me of the Clarins version, in fact I prefer its formula and price. I'm not someone who wears heavy eye make up but still prefers to remove what I do wear, including mascara before cleansing properly and this works a treat. I don't even find there is any left over product needing removal when I follow with an oil cleanser or similar. As I tend to use this for eye make up removal, similar products can leave the eye area irritated but I do not find that with the B make up remover with it's Vitamin B5 and Cucumber Juice ingredients. As a contact lense wear I can find dual action formulas or oils will leave a greasy film on my eyes but that is not a danger with this product and currently half price at Superdrug at only £3.95 this is a bargain. Next up are two old favourites from Liz Earle Instant Boost Skin Tonic Spritzer and Liz Earle Eyebright Soothing Eye Lotion . The latter is the perfect product if you're a hayfever season, and like me you're starting to find yourself reaching for the antihistamines to avoid scratching your eyes out. If you're the type to lay back and relax soaking a cotton pad with Eyebright and then taking five definitely treats suffering eyes, or in my case on holiday I used the formula to refresh eyes before a night out. The instant boost skin tonic is one of my favourite products and I especially love it's Spritzer bottle as I find it more favourable to use. Thanks to a combination of Caribbean sun, air conditioning and salt spray from one to many boat trips a quick spray from the skin tonic ensured my skin was hydrated and radiant looking. My serum step was met by This Works Energy Bank Skin Glow* which interestingly had been put on hold since my last Summer holiday. A a multi-tasking serum for lacklustre skin and notice a theme, adding hydration it was a light weight product that suited my vacations conditions. Applied in the mornings, or before heading out of an evening it's ingredients of Vitamin C and Red Algae Extract refine and brighten skin. Having returned home to brighter, but cooler conditions than I was used to in St Lucia all these products remain in my skincare routine and work equally as well - the eyebright is certainly getting a lot of use thanks to the time of year. 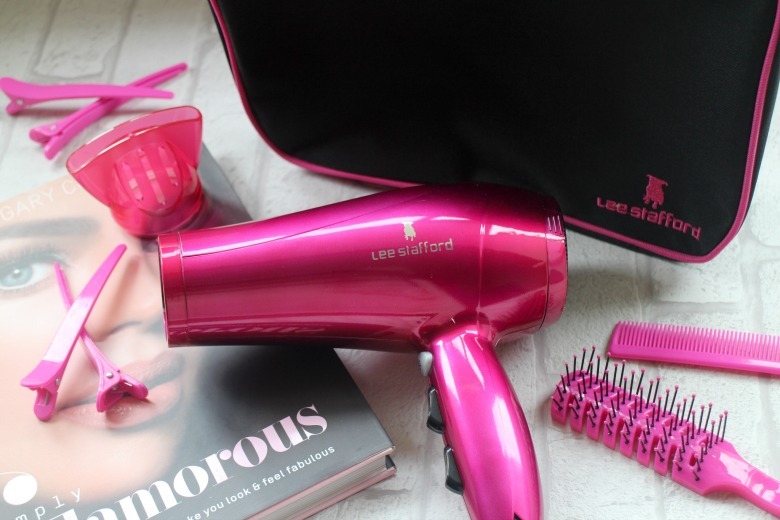 I'm teaming up with Lee Stafford once again to offer another fabulous giveaway for the Lee Stafford Blow Dry and Go Hair Kit* which offers everything you need to blow dry and style your hair, especially if you're always on the go. If you favour getting ready for a night out with the girls at your friends house or perhaps spend frequent nights sleeping over your significant other then read on. I have a travel hairdryer which does the job for me in a pinch and if really desperate I can use those on offer in hotel rooms but the Lee Stafford Hairdryer has become my first choice. This isn't a traditional travel sized hairdryer and certainly can be used for regular, everyday use thanks to a power 2200 watt motor, two speeds and three heat settings including a 'cool shot' function to set any style you have created but it's lightweight compared to the hairdryer I was using prior and is accompanied by a travel bag to keep everything in place. The bag is ideal as it opens fully and allows you to place your hairdryer inside, along with all your hair grips, bands, sectioning clips and room for any other hair tools you might need so you can simply grab and go. If you're a regular traveller this is ideal to have ready for any adventure you embark on and keeps things neat and tidy. If you scroll to the end of the post you will have an opportunity to win for yourself but fear not if unsuccessful the Lee Stafford Blow Dry and Go Hair Kit is a bargain at £21.99 and includes your travel bag, hairdryer, a selection of hair grips, bands and sectioning clips as well as a vent brush and sectioning comb. The hairdryer in a fun fuchsia colour means it will not go unnoticed and forgotten on your travels and more importantly is infused with keratin to dry hair quick and safer whilst smoothing and strengthening your hair looking like you've just stepped out of the salon. To be in with a chance of winning a Lee Stafford Blow Dry & Go Kit for yourself do enter your details below before Monday 24th April. Easter is one of my favourite times of the year, perhaps its the extra long weekend thanks to Bank Holidays and the fact if I'm lucky it falls around my birthday or of course the fact it is the first time since Christmas it's acceptable to eat chocolate for breakfast. 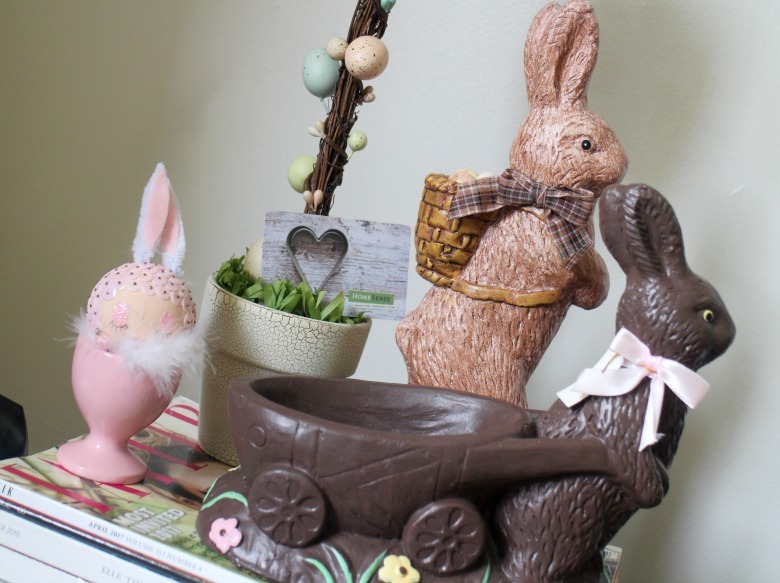 This penchant for Easter and the fact I'm often found spending more time in the home has seen me over the year gather all sorts of decor to brighten up my home and welcome the season. Past years saw my collection gathered from my visits to the US but recent times have led to my only needing to pop 10 minutes down the road to my local branch of Homesense*. Homesense whilst filled with an abundance of home decor to suit any home that sees me always leaving with something really makes its mark seasonally, you may remember my Valentine's Day post and Easter is no different. Whilst supermarkets are filled with the more childish items, paper garlands and Easter Egg Hunt kits, Homesense will have on display some beautiful items that will bring festive flair to any home. One of my favourite items is this faux chocolate bunny which would usually be housing some mini eggs had they not mysteriously disappeared. 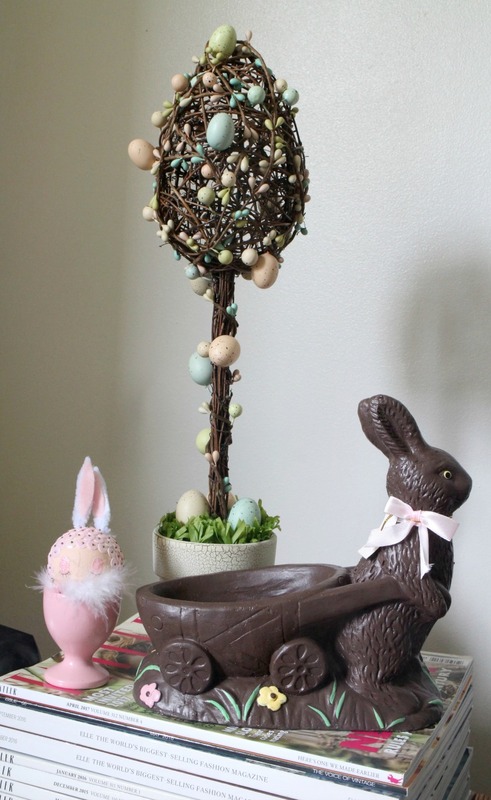 This bunny sits alongside another much loved item the Easter Egg tree which I will be sad to pack away once the weekend is over. Items range in price and style and if you're entertaining family and friends a few decorative touches could make all the difference. If you need another reason to get down to Homesense they will be hosting craft events in store such as egg decorating for you to get involved in. Something for the little ones whilst you treat yourself to what could become a family heirloom and a sign of the season. Will you be decorating for the Easter weekend? One of the exciting things about heading off on holiday, apart from the sun sea and sand of course is heading out to pick up all your toiletries in dinky travel size and I have a pretty healthy stash of travel minis I could reach for. That said I always panic, will I have enough for the duration of my trip, what if I run out before departure and then there are the products I already own in full size, is it worth duplicating with their smaller counterparts? Over thinking aside when I headed to St Lucia last month my travel allowance was not something to worry about and as I continue to enjoy working my way through products I actually own or have been sent all concerns were allowed to be ignored and it was full size ahead in my shower. During vacations there's a lot of showering, shaving of legs and prepping for a night of cocktails so I decided that Champneys Citrus Blush Enlivening Shower Mousse* was a perfect travel partner. I can't believe it's still going as it appeared in my August favourites last year as a Summer favourite so I thought it was ideal for my trip. From the Champney's 'A Little Pick Me Up' it designed to add zing to your shower routine with it's lemon scent so fitted nicely whether it was used following an early morning call for a boat trip or to liven me up for a night of cocktails after a lazy day poolside. As a mousse rather than a gel it's perfect for regular shaving duties required during holidays yet still adds a pampering feel to a monotonous task. I also paired the shower mousse with the matching scrub which became a 'house favourite' and found it's way into my empties pile so keep your eyes peeled for that post coming up soon. 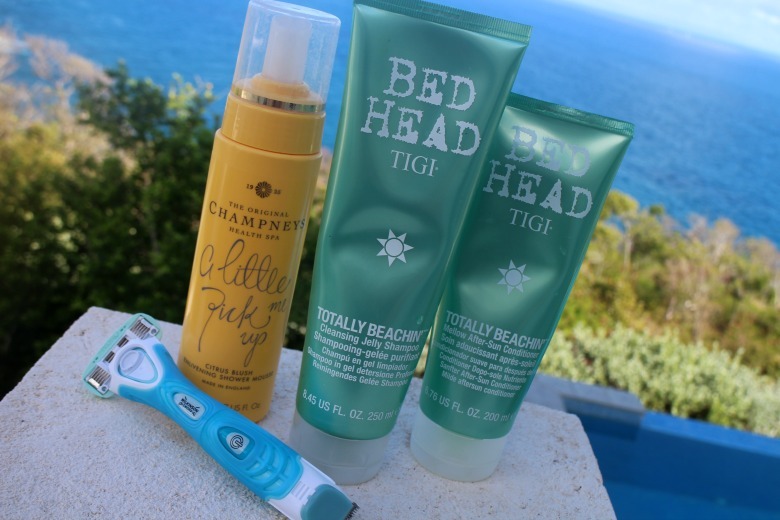 During the Summer months, or indeed those I'm holidaying in the sun Bumble & Bumble Surf Shampoo and Conditioner are my go to products, and they did travel to St Lucia with me but went rather unloved thanks to the Totally Bleachin' duo from TIGI Bed Head*. I'm sure I've said this before as there are a lot of TIGI Bed Head products I'm working with at the moment but the always smell amazing and the Totally Bleachin' range is no different with it's totally tropical mango and tangerine fragrance. 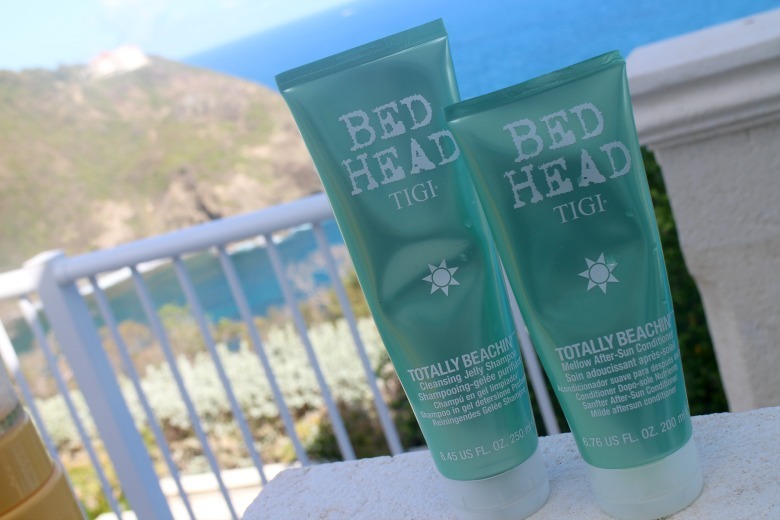 TIGI Bed Head Totally Bleachin' Cleansing Jelly Shampoo* and TIGI Bed Head Totally Bleachin' Mellow After-Sun Conditioner* are will both maintain colour vibrancy thanks to their protective UV complext and use Vitamin E to target signs of damage and leave hair soft and nourished. As my hair is coloured and dryer in recent years I found that just using a salt spray was sufficient and was conscious of drying out further with salt shampoo formlas. 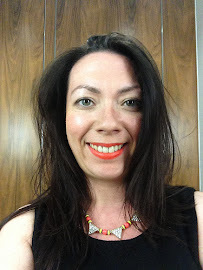 Using the Totally Bleachin' shampoo and conditioner ensured that my hair was left looking soft and shiny, even after a day travelling by boat at high speeds left me resembling Worzel Gummage and barely able to run a brush through. Every time I'm on holiday I'm reminded I really should look into laser hair removal, spending too much time keeping my legs hair free. For this trip I was sent the updated Wilkinson Sword Hydro Silk Bikini razor* which has the new added benefits including Pro-Vitamin B5 and Shea Butter to protect the skins natural oils and add a boost of hydration - no one wants scaly, red or bumpy legs on holidays do they. 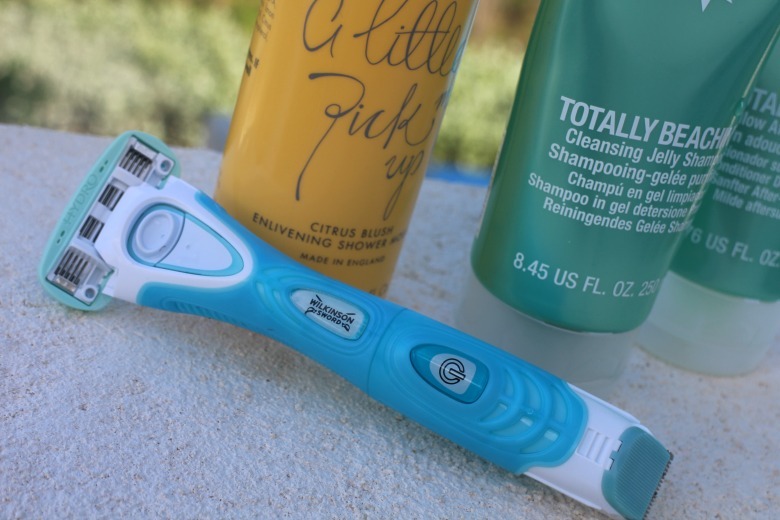 I have used the earlier version of this 2 in 1 trimmer with adjustable bikini trimmer with success and was once again pleased with it's use. 5 'curve sensing blades' provide closeness will reducing irritation and I do find this a gentle and more subtle shave. I wouldn't favour this for a heavier shave but for daily use it's perfect. I'll also give a nod to the replacement blades I purchased which come in handy travel sized packets so you can throw one or two into your make up bag without finding all sorts clinging to them when you go to use. What products must you have in your shower on holiday? I'm always torn when travelling abroad how far to take my skincare regime, sometimes I want to keep it simple other times I embrace the luxurious bathroom and enjoy the evening ritual of preparing for bed - even after one or two cocktails. 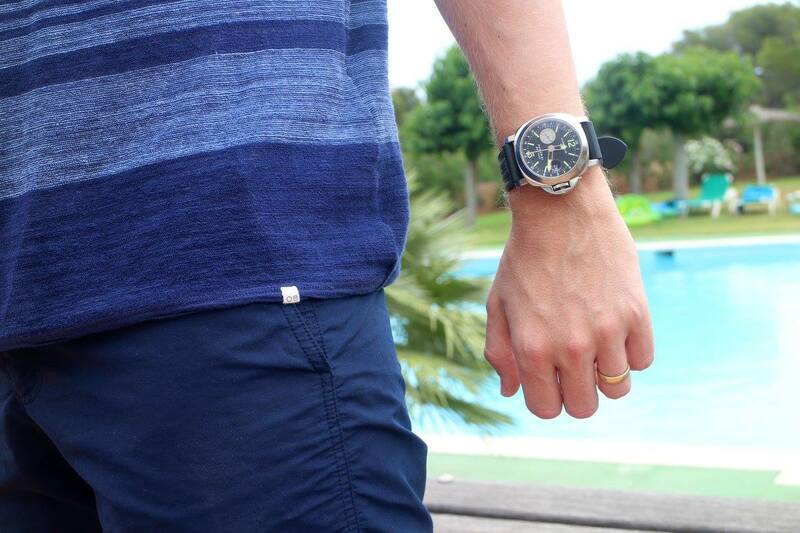 DHC have ticked the box for my travel needs of late and you may remember they previously accompanied me to Center Parcs so with a new addition to the line up it was time to spend a thorough 10 days putting them to the test in St Lucia. My morning cleanse came from DHC Mild Soap* which as I've shared before is my surprise favourite. Using facial cleansers in soap form is something we in the West aren't usually fans because of fears they would be drying and soaps by nature can often be messy things that aren't ideal for travel. Firstly let me assure you it is travel friendly, it's a small compact size and comes in its own case, or soap dish if you will so does not leave residue on sink tops or cause a mess in your bathroom. I've been using this for any overnight stays in recent months and it slots into the smallest of make up bags. Throughout my trip I'd cleanse my face in the morning and before getting ready for our evenings out to remove SPF and the grime from a day around the pool or travelling the island so I was conscious that anything too drying could cause me issue. I'd also find myself cleansing my face, then perhaps pausing for a conversation with a friend, answer a text or taking impromptu photos of rainbows and did not find any tightness to be my skin even before I began layering facial sprays and moisturisers. It's simple to use and it's method of use is like any other soap you've tried, add water, massage in hands and then onto your face. Of course there is 'foaming' but it's light and doesn't irritate skin, even after a day in the sun or following a dehydrating long haul flight. Soaps aren't a product that I would expect to be a luxurious experience but DHC Mild Soap really does and I'd highly recommend trying. A cleanser that slotted into my regime as and when it was needed was DHC Face Wash Powder*. This was a completely new product and concept to me I was unsure how I'd react but again, the unexpected impressed me. I had initial concerns that the DHC Face Wash Powder would be too harsh for my skin in it's powder form but it's nothing like a scrub and as soon as water is activated with the powder it turns into a creamy formula which can be lathered onto skin. Protease enxymes exfoliate the skin but are soft enough to use on a daily basis. I didn't want to risk using this daily and destroy my tan but in lieu of acid toners and the like it was great to refresh skin and remove any dull skin every couple of days or so. I did find that I had some peeling around my hairline and after one particular day in the sun the chance of my nose shedding but after using this face wash powder any damage was lifted without causing irritation and I thanked the lavender ingredients for it's soothing qualities. I'm certain depending on your skin type and requirements it would be a lovely product to use daily. This is a great product to travel with, especially as hand luggage thanks to it not being restricted by liquid allowances and allows you to forgo acid toners if space is limited. Having returned home and wanting to maintain my tan whilst ensuring that any dead skin is banished this product has found a home in my bathroom for regular use. Finally is the product that is one of DHC's most talked about and loved, DHC Cleansing Oil*. I was due to write and publish this post yesterday but as time ticked on and I was trying to work how adequately to talk about a product that is certainly great but I just don't love I suspected it was down to it's travel bottle. The travel size of this product requires you to shake the product into your and due to it's consistency I find myself quite aggressively fighting with the product which is often the last thing I want to do at the end of an evening before climbing into bed. I'm aware that the full size is in a more traditional pump so I decided to decant into a pump bottle I had to hand and see if that changed my opinion. I appreciate that packaging shouldn't be the main driver when using a product as this is a great cleanser that cuts through make up but if you are like me it's worth noting. This is a concentrated oil which I think is where my issues with 'shaking it out' come from as it doesn't flow with ease, far better from a pump but a little goes a long way and isn't greasy to use and feels very light on skin. I used with a flannel and followed with the KYPRIS Cleanser Concentrate as my second cleanse. There is always a danger on holiday from the combination of factors from SPF to one two many heavy meals skin can show the effects but I'm pleased to say that throughout the time I was away thanks to this trio of products my skin didn't suffer at all. Of course there were one or two other products that leant a helping hand and I'll be sharing them later in the week. Have you used any DHC cleansers before?